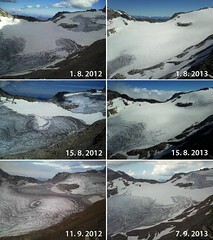 In the last decades Alpine glaciers have been loosing mass in an unprecedented speed. Both in scientific literature and the media mass changes of glaciers are often used to visualize climate change. However, quantitave information of the actual mass changes of certain glaciers is not availalbe before the processing of annual measurements during late summer. To make the data from the stations on the glaciers available in real-time, students from TGM developed a peripheral wireless data network, which was be able to operate under the harsh climatic conditions of an alpine environment. Researchers from ZAMG developed a data assimilation procedure, which will incorporate data from automatic kameras and meteorological and glaciological stations into a glacioclimatological model, that was used to calculate the acutal rate of mass change of the glaciers. In a final step, students of TGM developed a website, where the actual state of the glacier will be presented to a broader public. On the long run, the wireless data network that has been tested on Alpine glaciers within this research project will be installed on glaciers in the Arctic (e.g. on Freya Glacier in Northeast-Greenland, which is regularly measured by ZAMG), where the potential savings will be even higher due to the large distances and high travel costs.